For many years, New York City was considered to be the fight capital of the world. Local venues put on shows almost daily, and the mecca of boxing, Madison Square Garden, hosted boxing regularly. Fans flocked from one arena to the other to catch all of the action. 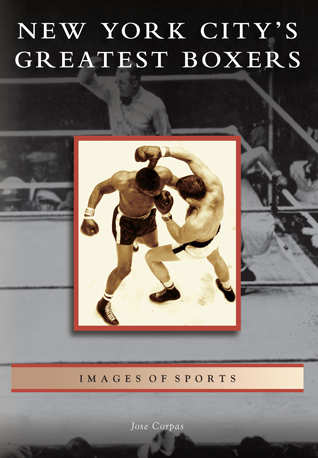 New York City's Greatest Boxers is a photographic journey featuring over 180 photographs showcasing many of the outstanding boxers who helped make up the city's colorful history. New York City's biggest boxing stars are all found here, from legendary champions like Terry McGovern and Benny Leonard to local stars and celebrities like Joe Miceli, Tiger Jones, and Tony Danza. Jose Corpas, former boxer, trainer, and cornerman, is a boxing historian and member of the International Boxing Research Organization. An official with USA Boxing Metro, he also founded the Web sites Professional Boxing Rankings and Big Apple Boxing.